Concrete is the ideal material for floors. It's smooth, hard, durable and soundproof. But it's normally a uniform and monotone gray, so unless you want a warehouse look, it needs to receive a decorative finish or have a floor covering installed. A basic prerequisite, in either case, is that the concrete be dry. Concrete is like a sponge, and can hold a lot of unnecessary moisture for long periods of time. Here is a finished basement acid-stained concrete flooring project that turned out great except for one small area, where a wet hose sat overnight. 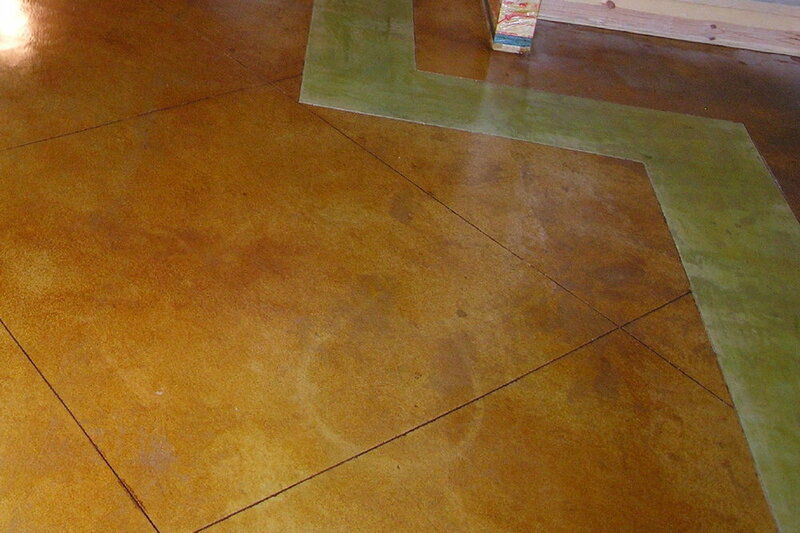 This color discrepancy was small enough that we were able to make it disappear through faux finishing. In the case of decorative finishes, like polished concrete, metallic epoxy, paint, acetone dyes, acrylic stains and other colored coatings, the main effect of excess moisture is to prevent the finish material from setting up and to weaken the ultimate bond strength. Depending on the amount of moisture, this may or may not compromise the integrity of the finish. With acid-stained concrete, the same destructive forces are at work. The difference is that the effects of dampness are usually more visible and appear at a lower moisture threshold. When acid-staining concrete, excess dampness has two possible effects: first, it can dilute the acid stain after it is sprayed and absorbed into the concrete, thereby lightening the ultimate color; second, it can prolong the reaction with the concrete and over-intensify the color. Although not always clear which effect may take place, the stain color usually lightens unacceptably at higher levels of excess moisture and darkens unacceptably at lower levels. Oftentimes, a color discrepancy is not so harmless. 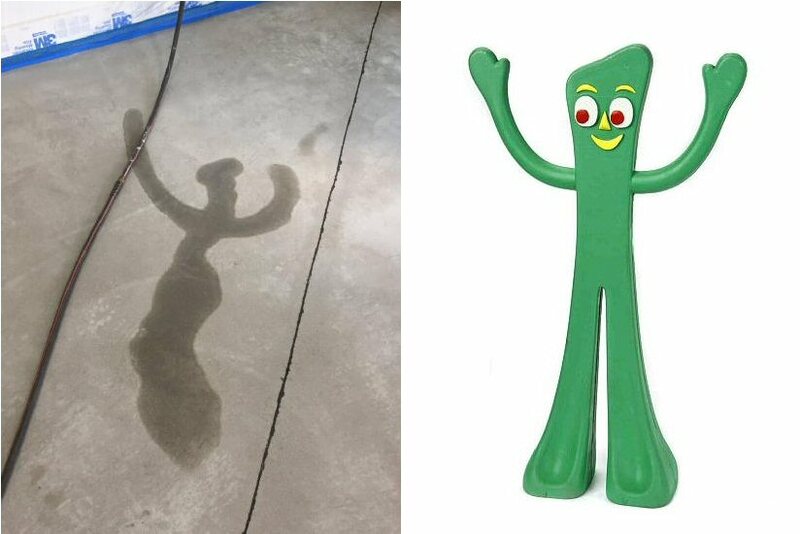 A leaking hose sat on this concrete floor overnight but ended up looking like a cartoon character. We set up drying aids to remove the shadowing before applying the acid stain. Either way, this can result in unsightly color discrepancies across the surface of the floor. Most of the time, these areas are so large as to be unfixable, and therefore must be avoided. There are two basic ways to avoid this problem when acid-staining: 1) conduct electronic moisture meter testing (ASTM 2659) at the outset of a project and again prior to staining; and 2) when cleaning the concrete using water, do not allow objects, especially hoses, buckets, boots and wet scrubbing pads, to sit in one area for more than 30 minutes. Even if excess dampness does not result in unintended, unsightly color discrepancies listed above, there is a third possible negative effect it can, and often does, have on a floor: in trying to evaporate, excess moisture is trapped by the clear sealer applied over the acid-stained concrete, condenses on the underside of the sealer film, and causes it to turn white, or "blush". This commonly occurs over cracks and joints in a concrete floor, which take longer to dry than other parts of the floor. The best thing about acid-stained concrete is that it looks so natural. It will only look natural, though, if the concrete floor has been properly prepped and is uniformly dry. If not, a project can be ruined in a matter of moments. Once the stain has been applied, there is no going back. So, if you're acid-staining a slab in an area that will receive high visibility, like a finished basement, restaurant or retail business, and you see or determine that certain areas have excess moisture, it's worth waiting until those areas are completely dry, and bringing in drying aids, like dehumidifiers, heaters and blower fans, if necessary, because any one of the three possible adverse effects, in itself, can ruin the project, and if all three happen together, it can result in a complete disaster. When dealing with moisture problems in concrete, it's always best to hire a licensed and certified contractor, if possible. Premier Veneers is licensed by the State of Michigan, and we are certified by the International Concrete Repair Institute (ICRI) in concrete slab moisture testing. We conduct moisture testing and use industrial drying aids on every acid-stained concrete flooring project - both prior to applying the acid stain and before applying the clear sealer. If the floor isn't dry enough, we simply wait until it is.